Your ability to use tax incentives will be the primary indicator of your business model. Depending on the laws and incentives in your state and county, some forms of ownership may be difficult to pursue. Others will be more advantageous. Sound financial and legal advice is imperative before you choose a business structure. It is critical that your business is structured to take advantage of as many federal and state incentives as possible to be competitive. In most states, an LLC will be better able to use tax incentives than a cooperative business. Windustry recommends consulting with both an accountant and an attorney experienced in wind development that is able to understand your particular situation to help you apply the most favorable business structure for your community wind energy project. As with most business ventures, this rule holds true: The greater the risk, the greater the potential return. How much risk are you willing to undertake, and how great a return are you looking for? You should consider the amount of risk you can take with your wind project in light of your other financial commitments. You need to determine how much of your own time and effort you are willing to put into this venture and whether you are able and prefer to serve in an “active” role or as a “passive” investor. Some business structures will require more participation from you than others. Material participation is the primary driver of business structure with respect to time and effort. For example, if you decide to own your own turbine, you will be responsible for repairs and maintenance. So you must either contract for maintenance or become an expert in wind turbine electronics and find yourself regularly climbing your turbine towers. Farmers who materially participate in the project by assisting with construction, performing operations and maintenance (O&M), or providing other services are able to take the federal Production Tax Credit (PTC) against their active income, and may not need outside equity. In contrast, a farmer who does not materially participate probably will not be able to take the PTC and may instead decide to purse a “Minnesota Flip” structure, described below. An individual farmer planning to put up one or two large turbines should expect to spend at least 10-20 hours per week for two years participating in the development of the project, whether the business is structured based on sole ownership or with outside investors in a Flip structure. An equity drive and other phases of project development may require full-time effort, somewhat independent of the business model selected. As with any business venture, there is more than one way to structure your involvement. 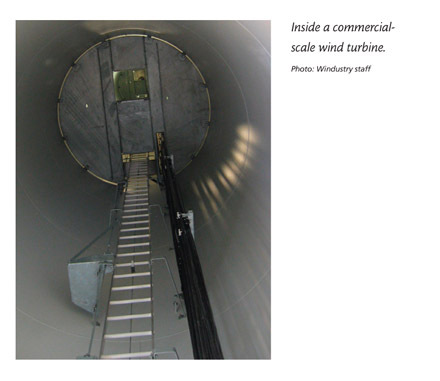 Do you want to own a wind turbine by yourself, or join forces with a partner? Or do you want to lease your land to someone else? You can financially participate in wind energy development in three basic ways. A wind developer is an individual or company that develops, constructs, owns, operates, and/or manages wind projects. Many developers perform several but not all of these roles. Developers essentially act as "middlemen" between landowners who have good wind resources and power suppliers or power marketers who buy electricity. Electric companies sometimes own the wind project and contract directly with landowners to host the turbines. Under this model, landowners hosting turbines can enjoy a fairly hands-off or involvement-free method of harvesting wind energy, as the developer assumes all financial obligations and liabilities. Developers usually sign contracts with landowners for either fixed yearly payments, a percentage of the annual revenue, or a combination of the two. Contracting with a wind developer involves the least time, least effort, least risk, and, of course, the least reward and lowest amount of control over a project. Developers typically approach property owners with specific projects in mind. Once you sign a contract to allow wind turbines on your land, you are not obligated to do any more work. This business structure is currently the most common form of large-scale wind ownership, mainly because turbines are so capital intensive. For more information about wind energy leases and easements, visit the "Leases and Easements" section of this Toolbox. Developers make their money by selling wind projects in various stages of development to the ultimate project owners who earn favorable returns through tax incentives and sales of windgenerated electricity to power suppliers or power marketers. In order to maximize their profit, they must build projects that produce that electricity at the lowest cost possible. If you can take advantage of tax incentives and sell your wind energy yourself, perhaps with other partners but without a developer as a middleman, you will likely earn greater revenue than with a fixed lease payment. However, you will also assume greater risk and responsibility. If you decide to build a partnership or pursue a joint venture to retain equity in wind turbines, you may choose to form a cooperative or create a pass-through entity, of which there are several types. Cooperative. In this form of business organization, the business is owned and controlled by those who use its services. Returns are based on patronage, not investment. Your cooperative can be either tax-exempt or non-tax-exempt. Cooperatives have a long tradition in the rural U.S., including farm-based energy enterprises such as ethanol cooperatives. However, the development of wind cooperatives has been hampered by their inability to take advantage of the federal production tax credit. Pass-through entities. A pass-through entity business structure allows tax credits and operating gains and losses to be allocated to the members of the entities rather than remaining with the entity itself. Some examples of pass-through entities that would qualify for the federal production tax credit include: limited liability companies, partnerships, limited liability partnerships, and sub-chapter “S” Corporations. Limited Liability Company (LLC) For several reasons, limited liability companies (LLCs) have become the structure of choice for farmer-owned wind projects. The characteristic factor of an LLC is that individual owners are not liable for debts and other claims incurred by the business (i.e., the owners’ personal liability is limited to the amount invested in the LLC – personal assets are shielded from risk). This also offers owners some legal protection in case of accidents and disasters. In this type of structure, gains and losses are most commonly allocated to the individual investors in the LLC, who pay personal income taxes on them. LLCs have several advantages over the other pass-through entities. An LLC can elect to be treated as a partnership, both for federal and state tax purposes. This means that if an LLC makes or loses money, the income or loss is allocated to each individual investor (i.e., member) of the LLC, who pays any taxes on a personal income basis. In other words, the LLC itself (unlike a corporation) pays no taxes. An LLC is also eligible for the federal production tax credit (PTC), which again is passed through to each member, usually in proportion to each member’s level of investment in the LLC. In some cases, locally-based wind projects must find a large equity partner with enough tax liability to fully use the PTC. In other cases, a group of local investors may have sufficient tax liability to take their share (or at least enough of their share to make the project viable) of the PTC, thereby obviating the need for large corporate equity partners. 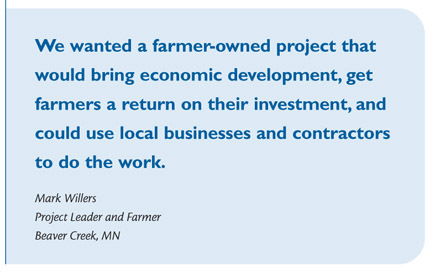 For example, the case study section of this Toolbox includes a case study of Minwind I & II, two farmer-owned LLC wind projects in Luverne, Minnesota that have succeeded without partnering with a tax-motivated equity partner. Partnership Partnerships are a little more risky than LLCs. In most partnerships, liability for the partnership's debts and liability for personal debt are considered to be “joint-and-several.” This means that each partner’s personal assets are at risk for any debts or obligations incurred by the partnership. So if only one partner has money, he or she is going to pay if anything goes wrong. Investors in partnerships can mitigate this risk by prohibiting the partnership from taking on debt. Limited Liability Partnership The main characteristic of a Limited Liability Partnership (LLP) is that liability is limited for at least one class of partners. LLPs, in many instances, consist of at least one general partner (whose liability is unlimited) and one or more limited partners (whose liability is limited). As with LLCs and other corporate structures, Limited Liability Partnerships have limits on the number of accredited and non-accredited investors; if you have over a certain number, you are required to file with the Securities and Exchange Commission (SEC) and follow procedures that could be costly. Also, if anyone dies or leaves the partnership, then you have to re-form it every time. LLPs are generally not used for wind energy businesses because in many states they are limited to certain professions and generally partners can be held responsible for liability from negligence. In the case of a wind energy business this liability can run into the hundreds of thousands of dollars or millions, exposing investors to significant risk. “S” Corporation An “S” Corporation may be advisable in certain specified situations; however, for this discussion, we should assume that there are too many rules and regulations that may prevent application here. For example, you can have only a limited number of members in an “S” Corporation, and you have only one class of stock, which may prohibit allocation of tax credits on anything other than a pro rata basis. Local and community ownership are additional emerging models of wind power development. If private interests can benefit from wind, why can’t local landowners and public groups do the same? A community-based project is perhaps the best way for the broadest group of people to participate in and benefit from harvesting the wind. The most common example of this kind of project to date has been municipal utility-owned wind turbines. A number of projects in Minnesota, Iowa, and around the country show how community interest in wind power has driven the local utility to build small commercial-scale wind plants. Wind turbines at schools are also gaining popularity as another model for community-based ownership, especially in Iowa where several school districts have discovered that wind energy can bring a new revenue stream for the school while providing an innovative tool for class projects and hands-on learning. The "Community Wind Projects" section of Windustry's website contains a number of examples of community-owned wind projects. The Minnesota Flip is a business model, typically in the form of a Limited Liability Company (LLC), that was created to provide a mechanism for local investors with limited tax liability to partner with corporate equity investors to take advantage of the Federal Production Tax Credit (PTC). Local investors contribute some startup capital to perform much of the predevelopment and development work, and an outside (tax motivated) investor with a significant tax liability contributes much of the construction capital. Typically, allocation of the PTC to participants in the LLC is proportional to the level of ownership in the LLC. The tax-motivated investor typically owns a significant portion of the LLC, 99% or more, during the first ten years of the project’s operation, when the PTC is available. When the PTC expires the tax motivated investor “flips” or sells the majority of their portion of the business over to the local owner. The amount of ownership that is transferred to the local owner after year ten is generally calibrated to the level acceptable to the IRS so as not to trigger an audit. Many projects have been developed in this manner in the state of Minnesota and the model is easily transferable to other states. For more in depth information visit the section of the Toolbox about "the Minnesota Flip." Cooperatives, as they are defined in law, provide benefits to cooperative members proportional to their level of involvement. A farmer’s dividend from a corn-based ethanol cooperative, in general, is defined by the number of bushels of corn that the farmer sells to the cooperative. After the initial contribution of capital to a wind project, for most farmers, there is little direct participation in the project aside from electing board members and attending quarterly or annual meetings making it difficult to justify participation and dividend payments. Cooperatives are passthrough entities, so it is difficult to take advantage of the Federal Production Tax Credit due to little or no passive tax appetite on the part of most investors. That said, several states, such as Minnesota and Wyoming, have enacted changes to cooperative law to allow for a larger percentage of outside equity investment, increasing the project’s ability to utilize tax credits as well as making it easier to acquire significant equity to satisfy lenders, without having to file with the Securities and Exchange Commission. The most successful use of this model to date is the South Dakota Wind Partners. The National Counsel of Farmer Cooperatives has developed a useful guide that explains cooperatives and how and why they are formed, and provides sample legal documents associated with cooperative ventures. Although most commercial wind projects in the U.S. are in one way or another reliant on sales of Renewable Energy Credits (RECs), either as an additional source of income (if not bundled with power) or as an inducement for a utility to purchase the power (if bundled), several farmer-owned projects have moved forward without relying on the Production Tax Credit, allowing them to use 100% local equity when developing the project. Each Minwind investor uses the PTC to the extent he or she can, in some cases utilizing passive investments in ethanol projects to provide passive income against which the wind project investors can claim the PTC. This keeps the projects in control of the local owners and significantly increases returns for investors. Various incentives, sites with a great wind resource, well-thought-out business plans, and experience in developing other large energy facilities led to the success of these projects. Business models that are not dependent upon the PTC in some cases allow projects to move forward when other projects are stagnating or waiting for Congress to renew the PTC, which makes acquiring equipment, construction teams, expertise, and PPAs much easier. For in-depth information about structuring these types of projects see the "Minwind Case Study". Your financial goals and the costs and availability of capital, and their influence on the size and structure of the project. Your overall return on investment and the expected cash flow in good wind years as well as bad wind years. The availability of strategically located sites and your confidence level in the wind resource assessment. The business model or ownership structure you choose will depend on your current financial situation, your goals, and possibly the enthusiasm or availability of others. Talking with other turbine owners about their business structures can be enormously helpful. It will take careful and creative thought to harvest your wind “crop”. A background in and skills used for marketing and risk assessment of corn as a commodity can be used for marketing your wind project. There is not one “best” business structure for a wind energy project, as what works in one situation may not in another. The success of any wind energy endeavor depends on the ability of the owners to maximize the benefits from wind energy incentives. Once again, it is best to consult an attorney and an accountant in order to determine the best business structure for your project.